Ahead of a reading of his new book Grant and I, Getintothis’ Paddy Hoey caught up with Robert Forster to talk all things Go-Betweens. Robert Forster is no ordinary popstar, but then his band the Go-Betweens were no ordinary group. His recently published autobiography, Grant and I, which tells the story of the band and the 30-year friendship with Grant McLennan, which drove it, illustrates how Forster is a literate and acute cultural observer and a brilliant writer. For a start, there aren’t too many pop star biographies that reference James Joyce on a number of occasions, few still mention the great Irish writer’s biographer Richard Ellmann. Forster even resembles Joyce on the back cover, a thin man with piercing eyes and austere round wire-framed spectacles. The Go-Betweens tale is as hackneyed as many indie bands’ stories of just missing out on stardom: signed in the 1980s to great indie labels, first Postcard, then Rough Trade and Beggar’s Banquet, and a handful of sensational songs that never quite cracked the charts. But the Go-Betweens weren’t a hackneyed indie band. Based around the considerable writing talents of Forster and McLennan, they produced beautifully evocative songs about love and loss, old film stars and growing up in Australia. Formed at the University of Queensland in 1977, they were all about French movies, Breton jumpers, Beckett plays, unfiltered cigarettes and a denim jacket with library tickets peaking out the top pocket. They were spoken in the same hushed reverence as the Smiths, Aztec Camera and their friends Orange Juice. Songs like Forster’s Spring Rain and Headful of Steam, and McLennan’s Cattle and Cane and Bye Bye Pride, captured a jangly indie spirit that wasn’t afraid of its artiness and archness. Even after the Go-Betweens split-up at the dawn of the 1990s, Forster and McLennan went on to make brilliant solo records and be members of the most highly rated band never to have made it. Then, against all odds and heading into their mid-40s, the pair got back together and made a couple of the best records of their career, Friends of Rachel Worth and the peerless and beautiful Oceans Apart which came out in 2005. They played a rapturously received Liverpool show in that year and everything seemed to point to the fact that this dog was finally going to have its day. Then, on the cusp of another great breakthrough, McLennan died at the criminally young age of 48. Forster has made excellent records since and has become a formidable journalist and critic and will be reading from Grant and I and playing some songs at Leaf on Tuesday, September 12. Talking to Getintothis from his home in Brisbane, Robert reminisced about Grant, the Go-Betweens and the romance of rock and roll. Getintothis: In 2005 when I met you after the Liverpool gig in the 02, I thought this was a band that was making its best music, you were writing your best songs in a long time because your lives were apparently so contented. It was surprising to note from your book that Grant was not as content as I had believed. Robert Forster: In 2005 we felt really good about the band and about the songs we were writing. When we were on the road Grant was really happy, he liked that lifestyle, and he loved being in the recording studio. But he hadn’t really built a home life, and by that I don’t mean he should have been married with 5 children, but he wasn’t happy at home; he was still living in shared houses and living the same life he lived when I met him at university when he was 17. By that stage he was in his mid 40s when he had free time he drank a lot and lived a very irregular life. Getintothis: In the book there’s never a real sense of who Grant was before you met and before he became a Go-Between. In the book there is reference to horse races on the big family property in Cairns in Northern Australia and his brothers coming to meet you in Western shirts and cowboy boots. Was he always trying to put to bed some kind of memory of life before university and the Go-Betweens? Forster: I think so. With Grant he had a life with his family up to the age of 11-12, and then he went away to boarding school, 1,000 miles away from his family for five years, and then he went to university, again as a boarder. There is this sense of family that was not strong with him and what family meant to him as a young boy was something he held on to in his songs. Cattle and Cane and Bye Bye Pride were about that pre-boarding school time that he felt very romantic about. By being sent away he was a little bit lost from that point onwards. Getintothis: Reading the book, it strikes me we don’t get pop stars like you anymore. It’s the only rock star biography I know that name checks James Joyce’s biographer Richard Ellmann twice! You and Grant belong to an era of rock stars, like Joe Strummer or Lloyd Cole who were interested in books and the Beat Poets and who drew from across the spread of popular culture. Forster: You’re right, it might be a generational thing. You can put people like Lloyd Cole and Morrissey in there, because books were read and when it came to writing lyrics or songs, it wasn’t denied. We acknowledged that this is part of what we had been exposed to before we started writing songs. It was about being exposed to books and not being afraid to incorporate them that was particular to that time. Go back Lou Reed, Bob Dylan, Joni Mitchell, and Leonard Cohen were people who read widely and deeply and put it in their work in their own way. People like me and Grant and Lloyd, or Joe Strummer were doing what we saw Leonard Cohen doing. It was being not afraid to put these things that were in your life into your songs. Getintothis: There is a sense of the romantic tourism of the Go-Betweens when you write about coming to Europe in the late 70s and living in Paris near the Beat Hotel and London. There is a romanticism about the Go-Betweens that was born out of the things you had read in books and magazines and heard on records. The chapter title Athens and Tear Gas is the best I’ve ever seen in a rock biography. Forster: A lot of the artists and the films and TV shows that we liked were made overseas and Australia is a long way away. So, we dreamt about Paris or arriving in England or New York. We were romantics because we were so far away and that made us dreamers and when we got there we went looking for things we loved. Getintothis: To paraphrase Bono did you find what you were looking for? Forster: Yeah, we did. Some cities were disappointing, but once you get there it was inspiring. When we got to London there was so much rock history. We came from Brisbane, a town where there was no rock history – but in London there were places where the Stones recorded or walked down, and there is the corner where David Bowie was photographed for the cover of Ziggy Stardust. There’s no landmarks where we are from and we were going to cities where bands had made albums. It was inspiring. You can get very blasé about it if you are from there, but for people like us from far away, these romantic thoughts ran through our heads. Getintothis: In the book you say you kind of always did everything on your terms, like your hero James Joyce, taking a zig-zag route. That wasn’t because you were arsey people, just that you didn’t know anything other than your kind of blundering fashion. Is that fair? Forster: It was, I never thought we were top 40 people. I was happy to make videos and record songs because I knew we could, and I was always aware that Grant was a brilliant melodic writer and had a great pop voice. But I never felt that the prize would be given to us, especially in the 80s when things were tricked out and shiny and safe. I didn’t know we had a place there. If we were to find a place it would have been in the mid-60s when things were more open. Stranger and more open people were given a place in 1965 rather than 1985. Getintothis: Bands are fed nonsense about manifest destiny by record companies that if a band does what the companies say, they will be successful. But the Go-Betweens prove that is not necessarily true and that every dog can have its day but only much later than was expected. Forster: It was. We were always an album band or we became an album band in the 80s. I don’t know, but it probably goes back to that belief that if you keep doing good work, doing your best and being true to yourself and saying the things you want to say, you will amass an audience. But It will happen slowly. Getintothis: Last two albums Friends of Rachel Worth and Oceans Apart prove that you were writing your best songs late in your career. There was a sense that this band has found its place, it’s just that it took a bit longer than expected. Forster: I agree with you entirely. I touch on it in the book, there was always a sense of potential in Grant and I, and the chemistry we had, in the songs we wrote and vision we had. We could always get good people to work with us and invest in us. People could see it and feel it still, it was remarkable even in our mid-40s when we made Oceans Apart. We were charging ahead, but it still had this sense of momentum that we had when we were 20 or 30. Getintothis: A remarkable thing that comes out of the book is the male relationship at its core. The relationship between the pair of you got stronger later in life and was almost unchanged from the first time you met despite some commercial and personal ups and downs. Forster: Part of it was there was great respect and neither one of us tried to dominate the other. When that happens, working relationships break down and tempers get frayed. Grant and I had similar tastes, similar enthusiasms and wishes and dreams and we were both easy to get on with each other. That’s what gave working together such pleasure and that’s what made it last and why we worked together for so long, we felt we were equals and not one of us tried to dominate the other and that’s what allowed it grow. Getintothis: There are few criticisms of Grant, in fact you are full of praise for his song writing, even the songs he produced during his solo career. In many respects, it’s one of the warmest pop biographies written. Was the relationship based on mutual praise? Forster: We didn’t voice these things to each other much and I regret that. We did towards the end more because we were older. When we were younger there wasn’t time to say that it was amazing because we were charging through. There wasn’t much of that. It’s why I take the opportunity in the book to do it, but Grant knew. I said things in interviews, in many ways, at one time, we communicated through interviews rather than face to face. 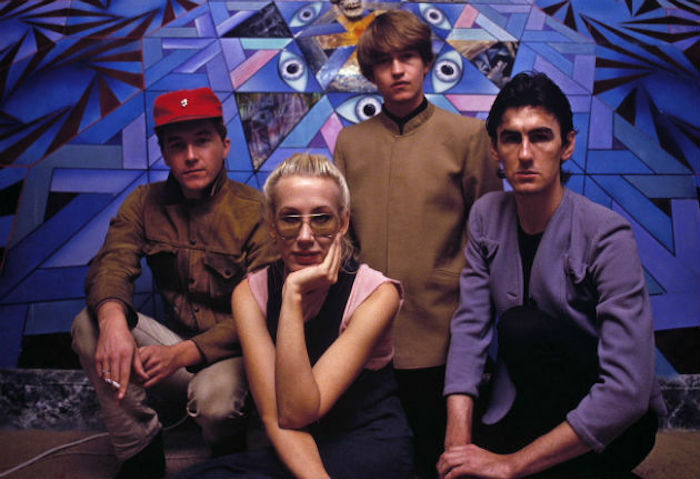 Getintothis: There’s something about the Go-Betweens that captures a kind of Australian pastoralism, that really captures the nuances of suburban Australian life, the sun and the shadows, what you christened the Striped Sunlight Sound. Seeing you playing the songs on the Striped Sunlight sessions captures your sensitivity to those elements of Aussie life. Forster: It’s something that we had in our music that came naturally it’s not something you can manufacture. With Australia, and Australian artists in general, you listen to music from the UK and Ireland, and USA. It feels like you are getting one thing in one ear and something else in other and the Australian stuff swells together with it. We were just trying to be true to ourselves and it has a little to do with the fact that we didn’t grow up in council estates or major cities. That environment breeds a kind of intensity in music, but where we come from it is more open and it is hotter and tropical and, in a way, it feeds into our music. The more cramped, intense music comes from different places to us. Getintothis: You write very romantically about playing music in your room and writing songs in front of an open window. When you’ve written songs like Lee Remick or Darlinghurst Nights or Here Comes the City, what do you see when you write the songs and then what do you see in your mind when you sing them live? Forster: I’m trying to get down the feelings I have. I have obsessions at the time when I am writing a song, and songs get written very quickly. But I can wait for months and I write no songs and you think it could be over, when is the next song coming? Then you get a good melody and you jump on it and you try and get lyrics before it dissipates. It’s very intense and it’s over very quickly. When I look back at Darlinghurst Nights I find I have written a song in 2004 about things that happened in 1984. It’s intense, but you are in control of it. Yet there is always a sense when I write a good song that I am also an audience to it as well. Then, when I play them I am proud of them and excited about playing them because I hope to get that across to the audience. Getintothis: There is a line on the book about the cosiness of the Go-Betweens. There is a warmth to your book and that there are no regrets about how it played out. Is that fair to say? Forster: It is. I don’t feel in any way bitter. I have theories in the book why we might have been more popular, but I have no bitterness. There are no great villains in the Go-Betweens story – it was a band doing the best that we could and I am happy with what we did. Getintothis: The book has rock and roll’s great Alan Bennett moment. You write: “‘How was it?’ Morrissey asked from the wings, gladioli in hand. ‘Terrible,’ I could only reply. He sighed.” When I read that I heard Alan Bennett saying that line. It’s brilliant. Forster: (Laughing) It’s amazing you say that because my wife has just taken our books back to the library, and mine was Alan Bennett’s latest collection ‘Keeping on Keeping On’. Thank you, Alan Bennett is high praise. Inside and Outside of The Go-Betweens – An Evening with Robert Forster. Tuesday September 12, 19:00 at Leaf.